CARE is at the core of what we do. At Providence, what matters to us is serving every person in ways that make a difference. We want to treat everyone with dignity, respect and compassion. Everybody Matters is a unique opportunity for all of us to come together, renew our passion and change lives. It is our chance to use our professional abilities and training to help people in desperate need realize that they matter too. By working together we can provide others with life-giving change. 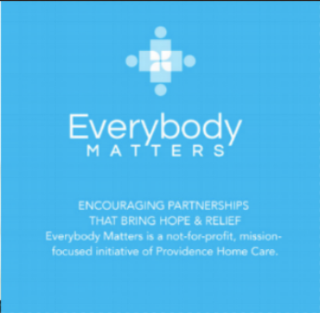 Providence Home Care contributes financially for every new patient that we serve through our home health agency in an effort to support the Everybody Matters initiative. Encourage your team by letting them be involved in Everybody Matters. Start by participating with us in a local project or short-term relief trip. Donate medical supplies, food and clothing appropriate to a specific cause. Partner with Providence for the home care needs of your patients. Refer and encourage your peers to partner with us.